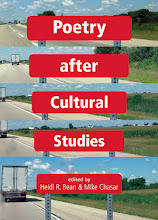 If you're a regular P&PC reader, then you know that we and the office interns have been thinking a lot lately not just about poetry and popular culture in general but about how poetry fares and has fared more specifically in relation to popular non-print media, especially film and television. We've been mulling over the odd ways in which Edwin S. Porter's short 1905 Edison Studios film The Night Before Christmas quotes sections of Clement Clark Moore's 1823 poem on intertitles (like the one shown here). We've been collecting examples of poems as they've been presented in various ways for audiences to read in films like Citizen Kane, G.I. Jane and The Grey and in TV episodes of Justified, Criminal Minds, and even the goofball crime-solving comedy Psych. Some of this is just our curiosity. Some of it is an extension of our interest in how poems and hymns around the turn into the twentieth century—like Oliver Wendell Holmes's "A Sun-Day Hymn" and Reginald Heber's "From Greenland's Icy Mountains"—were projected by magic lanterns to give audiences the then-new thrill of reading via a medium other than the material page. And some of it's a longer, more concerted effort to think toward a couple of new projects including (eventually) a new book as well as an article that we've been asked to write about the transitions in the culture of popular poetry between 1910 and 1920. 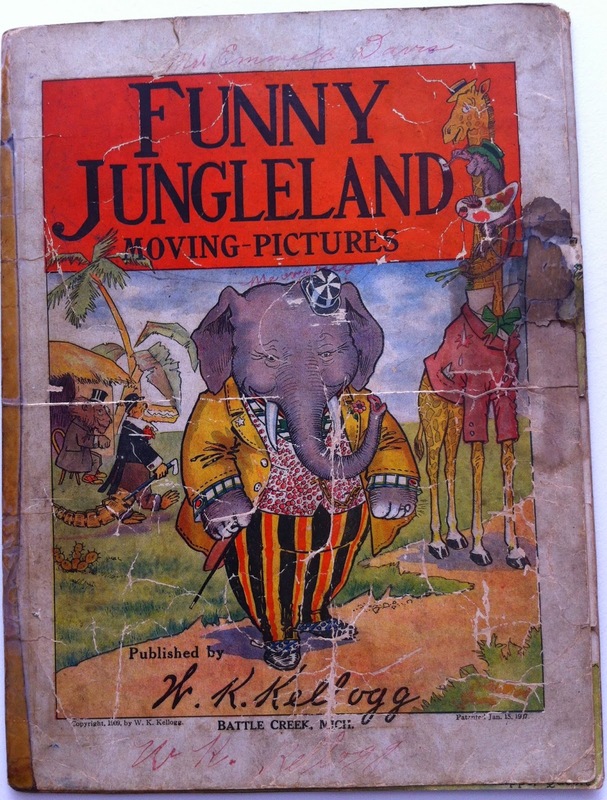 Imagine our surprise and joy, then, to come across the promotional item pictured here—an eight-and-a-half by eleven-inch "Funny Jungleland Moving-Pictures" poem booklet copyrighted by Kellogg's in 1909, four years after Porter's moving-pictures adaptation of Moore's "A Visit from St. Nicholas." If movies were trying to figure out how they related and might respond to poetry and print culture, then print culture and poetry were also trying to figure out how they related and might respond to the advent of film. And leave it to advertising to lead the way. Building on the tradition of the small folding or meta- morphic trade card that was a common form of advertising in the nineteenth century (see one here), Kellogg's takes things several astonishing steps farther, constructing a trifold booklet with two sets of six panels inside that, when flipped back and forth on their stapled hinges, allows a reader or user to superimpose the body parts and verse captions of one set of animals onto another. 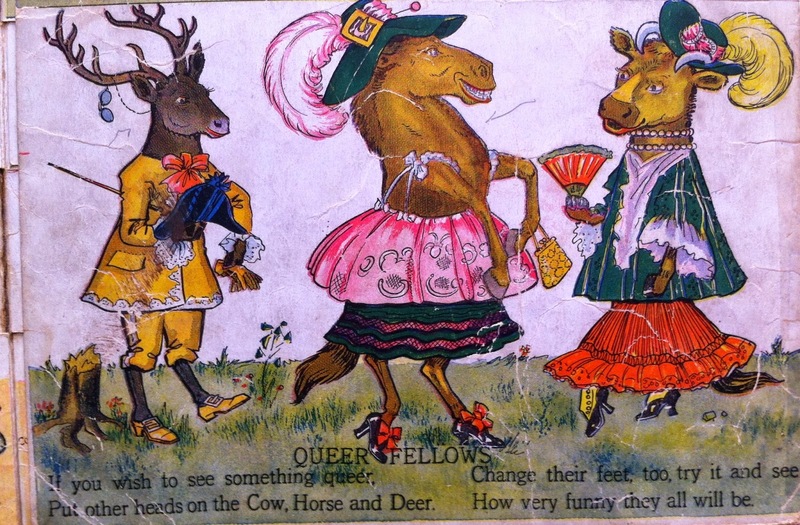 In other words, it's a game of inter-species cross-dressing—animals who are doubly in drag, since they are first dressed up like humans ("we're dressed like men, you see," one verse points out) and then, thanks to the booklet's innovative architecture, re-dressed to "wear" the clothes and body parts of other animals. "Let's change about," the Lion said. Of the Camel, Donkey and Kangaroo. Our friends won't know us then, would you? Put other heads on the Cow, Horse and Deer. How very funny they all will be. As the metrical variation that "too" in line three above might suggest—it changes up the metrical "foot" at the precise moment when readers are invited to "change [the animals'] feet," troping the motif of change in the pamphlet writ large—this is a pretty self-reflexive and (dare we say it?) unified aesthetic project from the vantage point of media. 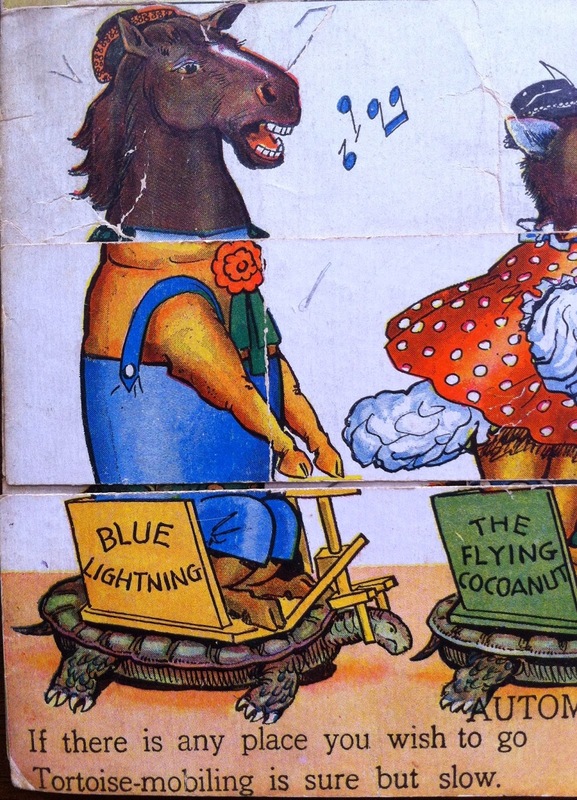 Even the seemingly incidental subject matter of the other verses—the refraction of light through water that produces rainbows in bubbles, the singing of songs, the "tortoise-mobiling" in the horse/pig panel pictured earlier, roller skating, and so on—keeps coming back to the topic of transmission and the tools by which various things (light, sound, bodies) get conveyed. But knew what to do. 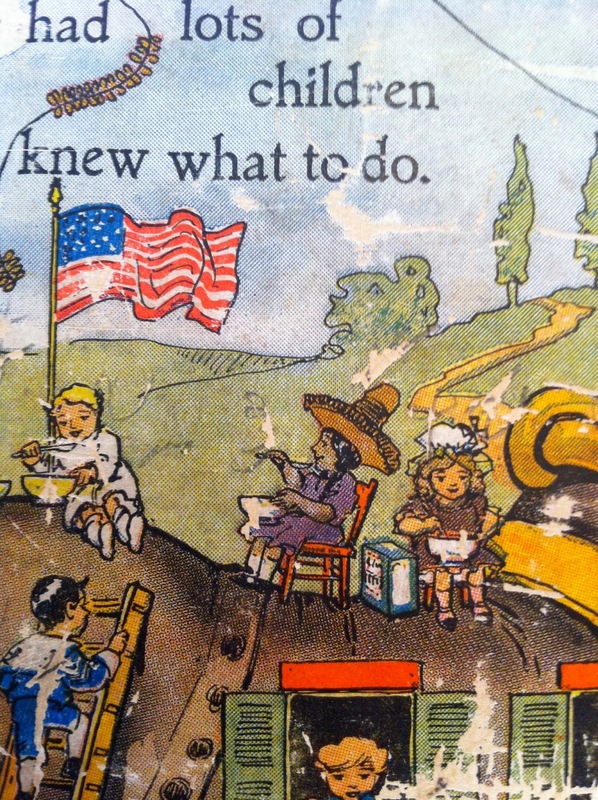 If you look closely, you'll see a little American flag flying from the shoe's toe, and if you look even more closely, you'll notice that while almost all of the children are white, one is clearly not. Sitting to the right of the flag is a girl who reads as indigenous Central or South American; not only is her skin darker, but she's got that ridiculously large hat to code her as ethnic in the event there was any doubt she's not. It's kind of hard not to wonder what sort of bookend she makes when paired with the grey-skinned elephant, so often symbolic of Africa's "Jungleland," who appears on the booklet's front cover. 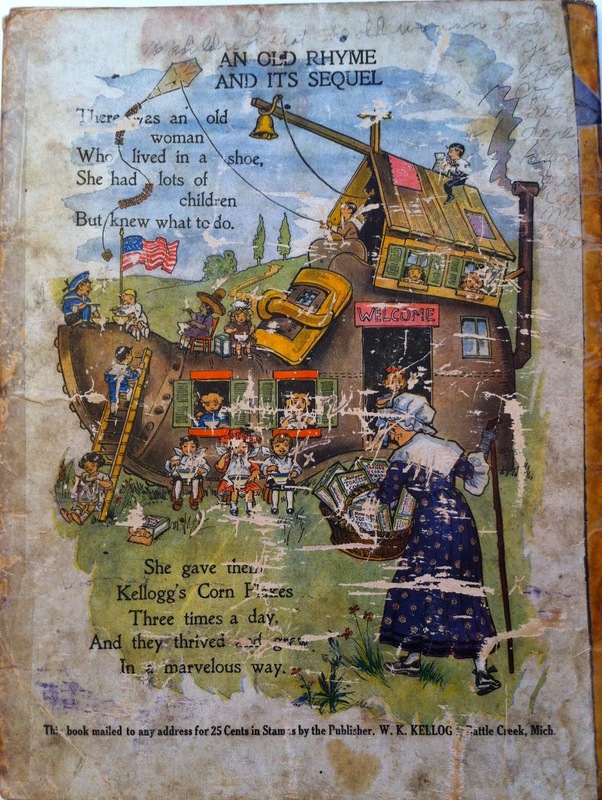 The subjects of race, romance, and the transmission and mediation of genetic stuff do not come up in the poetry, but the robust, darker-skinned male elephant, the single old white woman in the shoe, all of the assorted children including the girl with the hat, and that American flag kind of beg the issue, no? Where did the children come from? What America is being envisioned here? What "moving-picture" of a nation is being processed via this hands-on, media-rich, hybrid poem-film, exercise in queerness, drag, and cross dressing? As we know, the decade in which Kellogg's was designing, copy- righting, and circulating "Funny Jungleland Moving-Pictures" was the historical high point in immigration to the U.S. (the decade from 1901-1910 saw nearly nine million people immigrate, double the previous decade), so it would be crazy to think that everything going on in the booklet is not in some way related to social anxieties regarding the moving picture of race and ethnicity in the U.S. While we're not going to say that Kellogg's is being entirely progressive in relation to this history, it certainly does not look like an exercise in purity—a discourse that was commonly racialized in American advertising and especially, as we've discussed before, in soap ads. 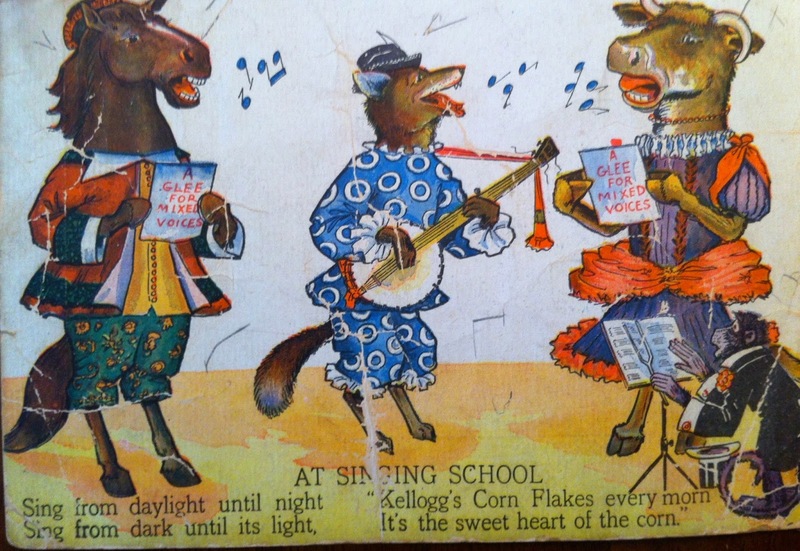 Instead, as the sheet music being held by the horse and cow in the panel pictured here appears to spell out, "Funny Jungleland Moving-Pictures" pitches itself—and Corn Flakes—as "A glee for mixed voices." Indeed, breakfast might be the most important meal of the day after all.